August has been a significant month for the disability and carers sector. There has been much hard work done by many people across the country over many years to get to this point. We have all shown that by working together, we will achieve good progress. There is still a way to go in delivering long term systemic reform, but I thank everyone for their efforts to date. On 10 August, I joined the Prime Minister as well as Minister Macklin and Assistant Treasurer Bill Shorten to release the Productivity Commission's final report and to outline our next steps - a very exciting day indeed! It is pleasing to report that the government is starting work immediately with states and territories on measures that will build the foundations for a National Disability Insurance Scheme. Take steps to establish an Advisory Group to the Select Council, led by Dr Jeff Harmer, to provide expert advice on delivering the foundations for reform and preparation for launch of the scheme. The Productivity Commission recommended that foundation reforms were a necessary precursor to the establishment of a functional and efficient national scheme. These reforms include development of common assessment tools to determine eligibility for support, development of service and quality standards so that people with disability can expect high quality support irrespective of what disability they have or how they acquired it, development of a national pricing structure and building the capacity of the disability sector and building workforce capacity. On Friday at COAG, the Prime Minister established the Select Council on Disability Reform. This will bring together Commonwealth and State Treasurers and Disability Ministers to do the work needed to lay the foundations for change. Big reform doesn’t happen overnight and there is much more work to be done to deliver the kind of support that Australians with disability deserve. The Productivity Commission's report finds that it would take at least seven years to transform disability services. Thank you to so many who have contributed to this process to date. I look forward to continuing to work with the sector to deliver meaningful change for people with disability and their families. On 3 August, Minister Macklin, Minister for Health and Ageing, Nicola Roxon, and I visited Carers Victoria in Footscray Victoria to launch the Australian Government’s National Carers Strategy. The strategy includes $60 million in new funding over the next four years. Australia's 2.6 million carers will receive improved recognition and support and help to ensure carers have the opportunity to take part in all aspects of society, including the chance to participate fully in work, community and family life. The National Carer Strategy has been developed in consultation with carers, state and territory governments, service providers and peak organisations. I want to thank all those people who took the time to attend consultation workshops or provide written submissions to inform the development of the Strategy. On more Carers news, eligibility for Carer Allowance for carers of children with Type 1 Diabetes has now been extended. As part of the National Carer Strategy, the Australian Government is extending automatic eligibility for Carer Allowance (child) to families and carers of children with Type 1 Diabetes aged up to the age of 16. From September this year, carers of children with Type 1 Diabetes aged more than 10 years who have a Carer Allowance Health Care Card for their child will automatically receive payment of the $110 per fortnight Carer Allowance (child). Currently, automatic eligibility for Carer Allowance (child) cuts out when children with Type 1 Diabetes turn ten years old. This rule was introduced in 2006 and Type 1 Diabetes is the only condition for which there is a cut-off age of 10. The change recognises that Type 1 Diabetes is a life long condition for which there is currently no cure, and provides parents and carers with recognition and financial support for the care they provide. Type 1 Diabetes requires complex management and treatment that can be difficult for older children and adolescents to manage. The Government will invest $42.6 million over four years to extend eligibility for Carer Allowance. Carers of children with Type 1 Diabetes who are already receiving Carer Allowance (child) do not need to act – Centrelink will amend their status to ensure payments do not cease at the age of 10. Carers of children with Type 1 Diabetes aged more than 10 years will have their payments backdated to 1 July 2011 if they had a Carer Allowance Health Care Card at that date. Carers eligible for payment back to 1 July 2011 will also receive the Carer Supplement of up to $600 and the Child Disability Assistance Payment of up to $1000. Carers of children aged up to 16 with Type 1 Diabetes who currently do not receive Carer Allowance (child) and who do not have a Carer Allowance Health Care Card for their child, will need to lodge a claim form with Centrelink. Carers of children with Type 1 Diabetes can contact Centrelink if they have questions about their eligibility. Event registrations for 2011 International Day of People with Disability have now opened! Communities from around Australia can now register their 2011 events for International Day of People with Disability (IDPwD). IDPwD is celebrated on 3 December each year to recognise people with disability, their achievements and contributions to our communities. As part of the day, local communities are being encouraged to promote greater inclusion of people with disability and participation of people with disability by holding or attending an event to celebrate IDPwD. To register an event, order your promotional products or to see what events are happening in your community visit the IDPwD website. You can also call 1800 440 385. Event registrations close on 25 November 2011. IDPwD is supported by Australian of the Year and IDPwD Patron Simon McKeon. The Australian Government is working with Nican, a national disability community organisation, to coordinate community events for the Day for 2011. The National Auslan Interpreter Booking and Payment Service (NABS) was recently awarded the Australian Business Award for Public Service 2011. The award recognises the NABS commitment to the deaf community and the professionalism of Auslan interpreters throughout Australia. The Department of Family, Housing, Community Services and Indigenous Affairs (FaHCSIA) funds Wesley Mission Brisbane to administer the NABS on behalf of the Australian Government. The NABS provides a free accredited Auslan interpreter for deaf Auslan users attending medical consultations provided in a private medical practice that either attract a Medicare rebate or are specified health consultations. delivers a flexible Diploma of Interpreting. In March 2011 the NABS celebrated its 100,000th interpreter booking. For more information about the NABS please phone 1800 246 945. Visit the Australian Business Awards 2011 website for more information. Seeds of Renewal is a grants program, supported by ANZ, which aims to contribute to building thriving communities in regional Australia. In 2011, the program will provide grants of up to $15,000 to community organisations for projects focused on creating education and employment opportunities. The grants are independently administered by the Foundation for Rural and Regional Renewal (FRRR) which manages a number of grants programs across rural and regional Australia. Not-for-profit community based organisations with an ABN or Incorporation Certificate which contribute to the development of education and employment opportunities of communities with a population of 15,000 people or less can apply. Applications close 5pm Friday 23 September 2011. For more information on how to apply, please call 1800 170 020, go to the Foundation for Rural and Regional Renewal website or visit your local ANZ Branch or Business Centre. FaHCSIA is undertaking a customer survey for Australian Disability Enterprise (ADE) customers to help to improve the ADE website. Customers are extremely important to the success of ADEs. The department wants to know what your customers think about the ADE website so it can better provide them with information on the products and services available from ADEs. The survey should take about 10 minutes to complete. The information provided will remain confidential and will be used to improve the website’s function and content. You can greatly assist us to make this survey a success by directing your customers to the Survey Monkey website to provide their feedback. In July, we distributed a special Indigenous focus disAbility e-news to our readers. The next issue of disAbility e-news will be another 'special focus' issue, featuring a number of articles on corporate governance topics that Australian Disability Enterprises and the disability sector may find useful. Is your ADE considering a merger or a change to legal status? Your Disability Employment Assistance (DEA) Funding Agreement with FaHCSIA requires you to keep us informed about any relevant matters that might affect your ability to meet your obligations under the Funding Agreement. This includes merger with another organisation or any other change to your legal status. P10.1 d) You must advise Us in writing if You intend to change Your legal status. It is important to discuss any potential changes to your organisation’s legal identity, such as a merger, with your FaHCSIA contract manager early in the process as there are likely to be significant implications for your Funding Agreement with FaHCSIA. It could be that a merger or other change to your legal status would mean that your organisation is no longer eligible for FaHCSIA funding. If you require any further information in relation to merger or changes to your legal status, please contact your State or Territory Contract Manager. When communicating via electronic media, e.g. email or fax, it is important that you do not include any information that may identify a supported employee to any outside party, should these communications be intercepted. Only FOFMS Id’s, i.e. Case Ids or Client Ids, should be sent via electronic media. Names, CRNs or any other personal information that may identify a supported employee, should never be transmitted. Electronic transmission of this information contravenes the Privacy Act 1988 and breaches the DEA Funding Agreement. b) only the Client ID or Case ID on FOFMS, as advised by Us to You, are used in electronic mail correspondence with Us. If you have any questions, please contact the Case Based Funding Helpdesk on 1800 034 887. An audit of the provision of Disability Employment Services conducted by the Australian National Audit Office in 2009 highlighted that some services may delay completion of a DMI Assessment following the achievement of 13-week employment outcomes. You must, in accordance with this paragraph 15, complete a DMI assessment when a Supported Employee achieves an Employment Outcome, ie after a Supported Employee achieves employment of 8 hours a week over 13 weeks. If, a DMI is not completed within 12 months then the case must be Exited in FOFMS immediately. You must perform the DMI assessment immediately after a Supported Employee achieves an Employment Outcome, otherwise You may be deemed to be in breach of the Agreement. It is also important to note that you must not perform a DMI Assessment if the supported employee has not yet achieved an Employment Outcome, i.e. you can not do a DMI Assessment early. Completion of a DMI Assessment outside of the guidelines may incur overpayments to your organisation which are recoverable by FaHCSIA. If the Initial DMI Assessment is not completed within 12 months of the Intake Completion Date (plus the period of Suspension if any) on FOFMS, payments will cease after you have received the 12th Employment Assistance payment for that particular case. FOFMS will then automatically exit the case if the DMI Assessment remains overdue. If you have any questions about the DMI process please contact the Case Based Funding Helpdesk on 1800 034 887. There are a number of useful resources available to Australian Disability Enterprise case workers to assist with understanding the Disability Employment Assistance Program and Funding Agreement requirements, Case Based Funding model, the Disability Maintenance Instrument and FOFMS. If you need further assistance with accessing any of these documents please contact the Case Based Funding Helpdesk or call 1800 034 887. Should you realise that a Case on FOFMS has been left active when it should have been Exited or Suspended, please contact the Case Based Funding Helpdesk for assistance in resolving the issue. The Helpdesk can advise you on what action to take and if there have been any overpayments. If there has been an overpayment, a debit in FOFMS is created which is off-set against future case based funding payments and a notification is forwarded setting out the details of the recovery to assist with any Audit and Compliance processes. The Case Based Funding Helpdesk can be contacted on 1800 034 887. If you have ever travelled through a little town called Walgett in far Northern West New South Wales you may have stopped for a coffee at Café 64. Café 64 is a well known establishment around the Walgett area. In fact, it’s the only dedicated café in town! It’s made its name for two reasons. One, its great coffee and service, and two, it’s the only employer of people with disability in the area. 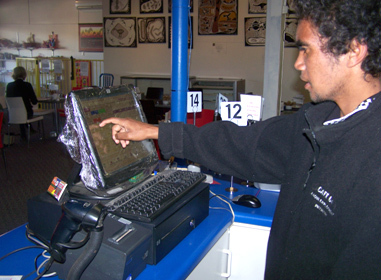 Café 64 is an Australian Disability Enterprise providing employment to about 20, mainly Indigenous, people with disability. They offer a dine-in and take away food service to the people of Walgett (population approx 2,000) and to the many travellers passing through to Queensland or heading to the tourist attraction of Lightning Ridge. Café 64 Chief Executive Officer Martin Wren says there is a wonderful sense of satisfaction and pride for the people that work there. ‘We’ve had some excellent feedback from visitors about our café over the years. Our team works hard to provide an excellent service, and has continued to do so while also going through some difficult times here at Café 64,” Martin says. 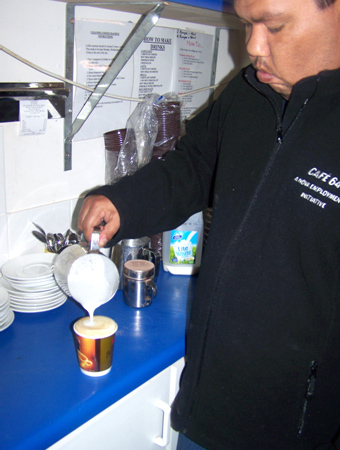 ‘Walgett was cut off due to flooding and lost power for several days during the January 2011 floods and the team pulled together during that time to keep the Café up and running,” he says. Martin says the Café links workers with TAFE to ensure all Café 64 staff participate in formal training (Barista and Cert 1 or II in hospitality). ‘We work with our employees to facilitate their movement to open employment wherever possible,’ Martin says. ‘Together we’ve created a first class business that pays good wages, develops skills and has been a great stepping stone for career advancement. ‘Our food and beverages are a fair price and our team works hard to make sure our customer’s dining experience is worth returning for more,’ he says. Café 64 were also the 2008 Runners up for the National Small Business Champions Award and the 2009 National Small Business Champions Award. Don’t forget to visit Café 64 next time you are driving through Walgett, located at 64 Wee Waa Street. Email disAbility e-news if you'd like more information on a particular issue or program in disAbility e-news or to let us know what you think of the newsletter. Your contributions to disAbility e-news are welcome. Do you want to let others know about your successes? Or how you engage with local businesses to create employment opportunities for people with disabilities? Email your story idea to disAbility e-news.